Welcome visitor you can login or Sign up. 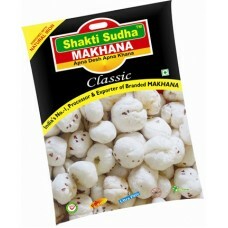 Shakti-Sudha Gorgon nut ,triple graded packed with heat transfer technology , that retain the nutritional medicinal value intact . 25 gm daily gorgon nut is recommended for a healthy life style . Gorgonnut or foxnut –an aquatic crop commonly known as Makhana is an highly nutritional ,fully organic ,fat free, 0 % cholesterol non cereal food . An immunostimulant food with medicinal properties good for preventive health management and maintaining healthy life style. Highly recommended for people suffering from life style diseases like Diabetes, anaemia , High blood pressure , Heart problem , kidney , arthritis rheumatic pain. Highly recommended for people suffering from life style diseases like Diabetes, anaemia , High blood pressure , Heart problem , kidney , arthritis rheumatic pain.Shakti-Sudha Gorgon nut ,triple graded packed with heat transfer technology , that retain the nutritional medicinal value intact .